Sony's new 5 mega pixel ultra high-resolution XCL-5000 digital video camera incorporates a new Sony 2/3 type Progressive Scan CCD sensor with square pixels. The XCL-5000 provides exceptional picture quality (2,448 x 2,050 pixels) and captures video at 15 frames per second. 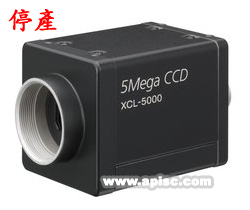 The XCL-5000 camera supports up to 12-bit processing to output data quickly and efficiently. This camera enables the capture of high-speed, high-resolution images while simplifying connectivity to machine vision systems with its standard 3M MDR 26-pin connector. Incorporating a variety of convenient features such as partial scan and external trigger function allowing for the clear capture of fast moving objects or still images in low light environments. Sony's XCL Series are the ideal solution for today's wide range of machine vision applications.